The attraction's roots date back to even before Disneyland was built, when Walt Disney had just hired the first of his Imagineers. The first known illustration of the park showed a main street setting, green fields, western village, and a carnival. Disney Legend Harper Goff developed a black-and-white sketch of a crooked street leading away from main street by a peaceful church and graveyard, with a run-down manor perched high on a hill that towered over main street. While not part of the original attractions when Disneyland opened in 1955, Disney assigned Imagineer Ken Anderson to make a story around the Harper Goff idea and the design of his new 'grim grinning' adventure. Plans were made to build a New Orleans-themed land in the small transition area between Frontierland and Adventureland. Weeks later, New Orleans Square appeared on the souvenir map and promised a thieves' market, a pirate wax museum, and a haunted house walk-through. After being assigned his project, Anderson studied New Orleans and old plantations to come up with a drawing of an antebellum manor overgrown with weeds, dead trees, swarms of bats, and boarded doors and windows topped by a screeching cat as a weathervane. Despite praise from other Imagineers, Disney did not like the idea of a run-down building in his pristine park, hence his well-known saying, "We'll take care of the outside and let the ghosts take care of the inside." For inspiration, Disney journeyed out to the Winchester Mystery House in San Jose, California and became deeply captivated with the massive mansion with its stairs to nowhere, doors that open to walls and holes, and elevators. Anderson came up with stories for the mansion, including tales of a ghostly sea captain who killed his nosy bride and then hanged himself, a mansion home to an unfortunate family, and a ghostly wedding party with previous Disney villains and spooks like Captain Hook, Lonesome Ghosts, and the headless horseman. Some of the Universal Monsters were even planned to appear. Rolly Crump and Yale Gracey, two Imagineers put in charge of the spectral effects, recreated many of Ken Anderson's stories. Disney gave them a large studio at WED enterprises; they studied reports of hauntings and Greek myths and monster movies, eventually making quite a show in their private studio. Some of these effects frightened the cleaning crews that came in at night to such an extent that the management eventually asked the crew to leave on the lights and to turn off the effects after hours. Defying this, Crump and Gracey connected all the effects to a motion-sensitive switch that, when passed, would turn everything on. The next day when the two returned to work, all the effects were running with a broom in the middle of the floor. Management told them that they would have to clean the studio themselves, because the cleaning crew was never coming back. The duo made a scene where a ghostly sea captain appeared from nowhere. Suddenly a wretched bride emerged from a brick wall and chased the ghost around in circles. The frightened pirate melted into a puddle and flooded the entire scene only for the water to mysteriously vanish with the bride. "A ghost haunted by a ghost!" Rolly told Walt between chuckles. Walt and the Imagineers were amazed, but Walt still didn't like how the project was coming out. That put the mansion on hold for quite some time. The decision was made to place the attraction in the New Orleans Square section of the park, and thus the building was themed as a haunted antebellum mansion. In 1961, handbills announcing a 1963 opening of the Haunted Mansion were given out at Disneyland's main entrance. Construction began a year later, and the exterior was completed in 1963. The attraction was previewed in a 1965 episode of Walt Disney's Wonderful World of Color, but the attraction itself would not open until 1969. The six-year delay owed heavily to Disney's involvement in the New York World's Fair in 1964–1965 and to an attraction redesign after Walt's death in 1966. Many Imagineers such as Marc Davis, X Atencio, and Claude Coats contributed ideas after the fair and after Ken Anderson left the project. Rolly Crump showed Walt some designs for his version showing bizarre things like coffin clocks, candle men, talking chairs, man-eating plants, tiki-like busts, living gypsy wagons, and a faced mirror. Walt liked this and wanted to make the proclaimed "Museum of the Weird" a restaurant side to the now named Haunted Mansion, similar to the Blue Bayou at Pirates of the Caribbean. Although the idea was never realized, some aspects of it lived on in the final attraction. Marc Davis and Claude Coats, two of the mansion's main designers, were in a constant argument over whether the ride should be scary or funny. Claude, who had a life of a background artist, made moody surroundings like endless hallways, corridors of doors, and characterless environments, and wanted to make a scary adventure. Marc, who designed most of the characters and zany spooks, thought that the ride should be silly and full of gags. In the end both got their way when X Atencio put all the scenes together. After Disney's death in December 1966, the project evolved significantly. The Museum of the Weird restaurant idea was abandoned, and the walk through idea was replaced by the Omnimover system used in Adventure Thru Inner Space, renamed the Doom Buggy, a promising solution to the problem of capacity. Imagineers had been fighting the low-capacity nature of a walk through attraction for years, even going so far as suggesting building two identical attractions to get double the number of guests through. On August 12, 1969, the Disneyland version of the attraction was officially opened to guests, though there were employee previews on August 7 and 8, 1969, and then some "soft" openings when park guests were allowed to ride on August 9, 10, and possibly the 11th. The early opening to the public was advertised in full-page newspaper ads, creating the anomaly of either two official openings or an advertised "soft" opening. A special "Midnight" Press Event was held on the evening of August 11, and the ride opened to the public on Tuesday, August 12, 1969. The opening brought in record crowds and helped Disney recover from Walt's untimely death. In the early 1970s, the Imagineers gave some semi-serious thought to resurrecting many of the creatures and effects that Rolly Crump had originally created for the Haunted Mansion's pre-show as part of Professor Marvel's Gallery, which was "... a tent show of mysteries and delights, a carousel of magic and wonder". This was to be built as part of Disneyland's Discovery Bay expansion area. At the time of its opening, some considered Disneyland's Haunted Mansion a disappointment. Ken Andersen, an Imagineer who was responsible for many of the mansion's early concepts and storylines, was upset with how the attraction turned out; Imagineer Marc Davis claimed that "too many cooks" had been working on the attraction. Some park guests wondered why the attraction wasn't scarier. Nonetheless, today the attraction is one of the most popular in the park, drawing thousands of guests every day. In 1999, a retrospective of the art of The Haunted Mansion was featured at The Disney Gallery above the entrance to Pirates of the Caribbean. 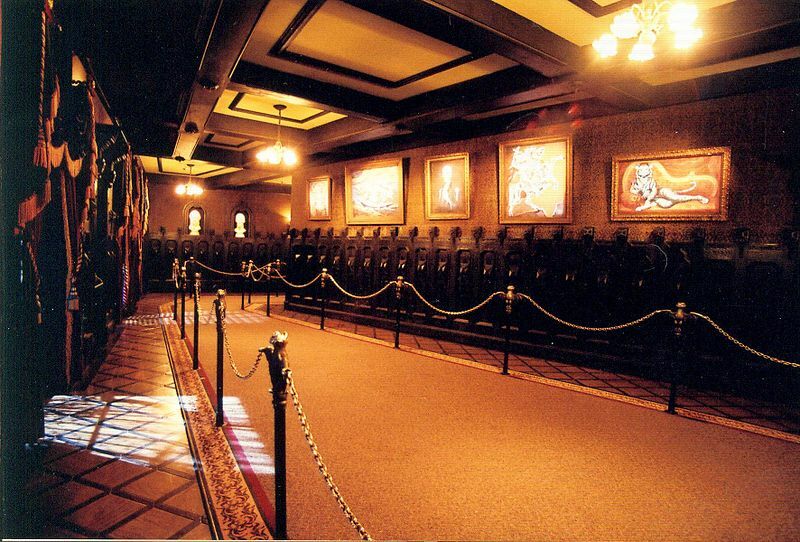 When the 2003 film The Haunted Mansion was released, a retrospective of its art was featured in the gallery as well. In October 2001, Haunted Mansion Holiday premiered, a seasonal overlay featuring characters from the 1993 film "The Nightmare Before Christmas". The seasonal overlay was inspired by the question of what would happen to the Mansion if "Sandy Claws" landed there. In October 2005, Slave Labor Graphics began publishing a bimonthly Haunted Mansion comic book anthology, with the main recurring story (Mystery of the Manse) centered around "Master Gracey" and inspired by the sea captain concepts proposed for the attraction by Ken Anderson in the 1950s. The comics are non-canon. In July 2010, Guillermo del Toro announced that he is set to write and produce a new movie based on the attraction, promising that it will be both scary and fun.